Has the week been treating you well? I mentioned the other day that it seems we have gone straight from winter into full blown summer. So while it was quite warm I took the opportunity to whip out my brightest neons and have some fun. I have had this idea for ages but wanted to hold off as long as I could because it is definitely summery. Anyway, I couldn’t wait anymore so here it is. 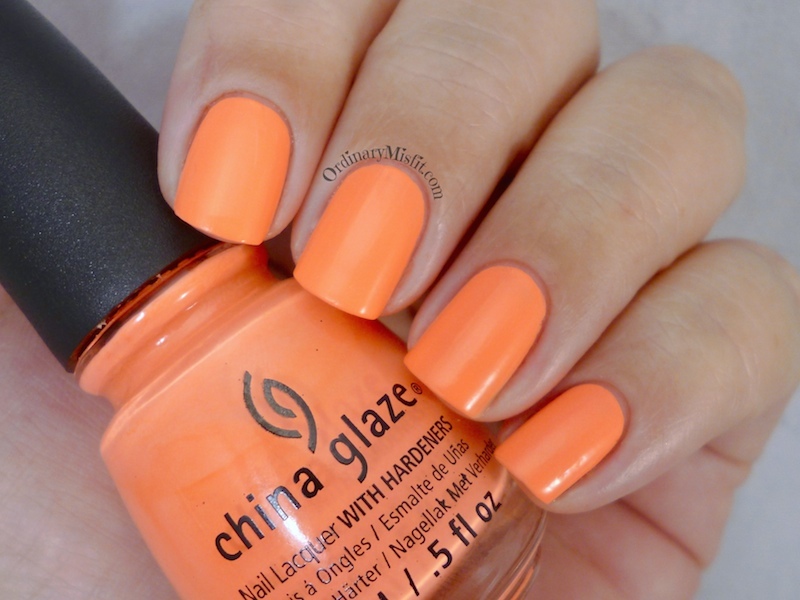 I started off with 2 coats of China Glaze – Flip flop fantasy on my pinky, index and thumb. I have heard that one batch of this polish had a really awful formula but I seem to have been lucky because it’s really quite nice. It is so bright and is definitely more orange than coral. (I’ve seen it referred to as coral / pink toned a few times now, I assume a different formula) Because it is so super bright it isn’t very easy to photograph but I think I did an ok job at capturing how super bright it is. Anyway, I then started with 2 coats of OPI – Funny bunny. Funny bunny is a beautiful, soft, white jelly. Once the white was dry I added a strip of non-fast drying topcoat down the middle of my nail and then went to work placing the neon glitter I bought at Born Pretty Store randomly in the strip down the centre of my nail. Then I added another coat of Funny bunny to create a sandwich of this glitter. Once that was 100% dry I taped off the strip down the middle and went in with China Glaze – Flip flop fantasy to great the sides. That part didn’t come out perfectly but oh well 😉 I then top coated and voila! Beautiful huh? This is 2 coats with no topcoat. Like I said, my formula is pretty good for a neon. This is 3 coats with no topcoat. Soft, squishy white jelly. I love this. What do you think of this? I am not really a summer person weather wise but I do love the summer colours on my nails. Yay! Funny bunny and the neon dots are super pretty! I am obsessed with this glitter. It is so pretty and so fun. Thanks Kerry. I love FFF. I am not sure which version I have, but I like whichever one it is, haha. Thanks Lesley. Hahahaha I feel the same. I don’t know what version I have but I love it.